Ratnakarashanti (Skt. Ratnākaraśānti; Tib. རིན་ཆེན་འབྱུང་གནས་ཞི་བ་, rinchen jungné shyiwa, Wyl. rin chen 'byung gnas zhi ba, or Skt. Śāntipa; Tib. 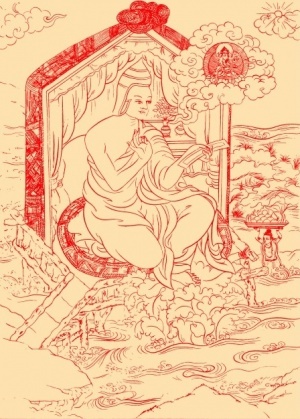 ཤན་ཏི་པ་, shan+ti pa) (roughly 970 - possibly after 1045) was a famous Indian scholar who held the positions of gatekeeper of the Eastern direction and abbot at the great monastic university of Vikramashila at the beginning of the 11th century. He was renowned as the 'Omniscient One of the Degenerate Age' (Skt. kali-kāla-sarvajña). Under the name of Shantipa, he was also one of the eighty-four mahasiddhas, the great realized masters of the Vajrayana teachings. He was a prolific writer and about forty of his works have been preserved in the Tibetan Tengyur. He wrote extensively both on sutra and tantra, which he interpreted consistently according to a particular Nirakara Yogachara doctrine. Because of this, despite his tremendous importance and influence in India and Tibet, he has been vilified by sectarian Tibetan Madhyamikas, which subsequently diminished his influence in Tibet. He wrote several works on the Prajnaparamita and Hevajra Tantra, and a commentary on the Guhyasamaja Tantra. He wrote two texts which contain in their title Madhyamakalamkara, where he argues against Chandrakirti and Shantarakshita. Taranatha mentions he studied with Naropa. He was a contemporary and a teacher of Atisha and Abhayakaragupta. Other students include Maitripa, Shraddakaravarman (Skt. Śraddhākaravarman) and Drokmi Lotsawa. There is a famous story that when Ratnakarashanti passed away, Atisha, who was in Tibet at the time, knew that and was grief stricken, saying that now no one in India was able to distinguish anymore between the Buddhist and the non-Buddhist. ↑ See Seton's entry in the Brill Encyclopedia. Brill’s Encyclopedia of Buddhism, Volume Two: Lives (Brill, 2018), Ratnākaraśānti. Lama Chimpa, Alaka Chattopadhyaya and Debiprasad Chatterji, Taranatha's History of Buddhism in India, Delhi : Motilal Banarsidass, 1990, page 295 and pages 299-300. Abhayadatta, Buddha's Lions: Lives of the Eighty-four Siddhas, translated by James B. Robinson (Emeryville: Dharma Publishing, 1979), pages 60-64. This page was last edited on 27 March 2019, at 16:22.